This study was undertaken to examine the factors contributing to laparoscopic adjustable gastric band (LAGB) removals among adults > 18 years of age. We hypothesized that female patients with multiple comorbidities would have increased removals. This retrospective exploratory study uses internal records and standard statistical methods of analysis. Eighty-five bands were removed (11.8% males, 88.2% females). The average BMI was 40.7 (n = 83). 2.4% of patients had removals between 0 and 12 months, 18.8% between 39 and 51 months, and 35.3% between 39 and 64 months. 8.2% of treatment times were unknown. The average treatment time was 67.9 months. 48.2% of patients had ≥ 2 comorbidities, GERD (44.2%) being the most frequent. 49.4% of patients reported dysphagia as the reason for band removal. 22.4% of removals were associated with band failures, none with port complications. The reason for band removal was unknown in 21.2% of patients. 67.1%, 32.9%, and 23.5% attended 30-, 60-, and 90-day follow-up appointments, respectively. Weight post-band removal surgery at 30, 60, and 90 days was noted to be − 0.4%., 0.9%, and 0.4%, respectively. 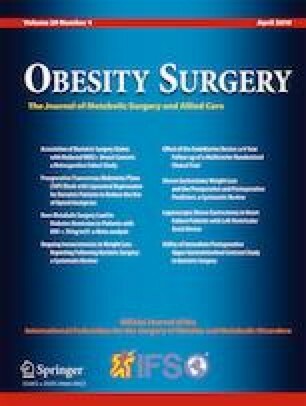 This study supports current literature suggesting LAGB may not be an effective long-term surgical intervention for obesity. Patients with > 2 comorbidities had increased rates of removal. Dysphagia was noted to be the primary reason cited for LAGB removal. Postoperative follow-up was found to be a significant challenge for LAGB removal patients. Further study is warranted to explore if these poor follow-up rates should be considered when risk stratifying LAGB patients for revisional surgery. For this type of study, formal consent was not required.